●Mini-pattern moving head light, compact structure, the output is good, with a variety of patterns, easy installation, easy to carry, moving in light weight, projection accuracy, good effect. Built-in program: standard voice, self-propelled, master-slave, DMX. Scanning angle: 540 °, speed can be controlled, 270 °, speed can be controlled. Use: for dance halls, KTV, PARTY, home decoration lights are widely used in the stage, wedding, and other different occasions; increase the romantic atmosphere. ● We have always been trying to provide the best service and reliable products for every customer, however, may may sometimes sometimes, please contact us to resolve any issue before going to a negative feedback. Scanning Angle have 540 °, speed can be controlled, 270 °, speed can be controlled. 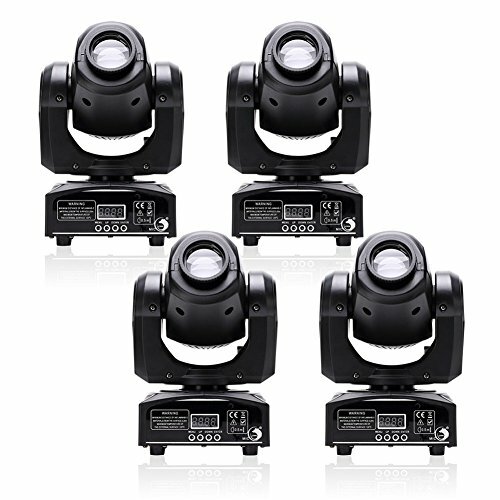 Moving Head Light for DJ Dance halls, KTV, Party, Home decoration are widely used in the stage, wedding, and other different occasions, increase the romantic atmosphere. Lighting effect video:https://youtu.be/79SKcG2dxos. Free return and fast refund in without questions in 1 month if you are not satisfy this product.